This section features the foundation sires as well as the most influential males used through the decades, in the Fairoaks line. 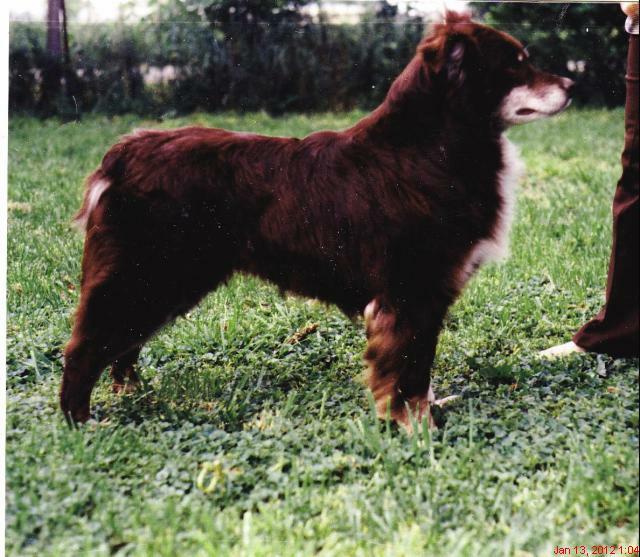 ​​​​Cody was one of the first Aussies shown in Obedience and Conformation in the Midwest beginning in 1971. 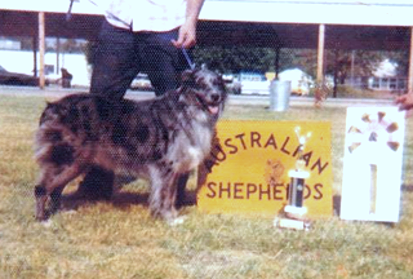 At that time there were no ASCA sanctioned shows so we competed at All-Breed Matches. He was known for his "high in trial" obedience abilities having been in the ring 20 times and High In Trial 13 times. With my persistence, Misc. classes started to be offered for Conformation during the early 70’s and Cody acquired over 50 pts before I found that there was a show program offered thru ASCA. In 1973 the ASCA show conformation program began. Cody quickly finished his conformation championship. He was finished at the 1974 ASCA of Michigan Spring Specialty - B.O.W. At this time most everyone that had Aussies had them for working or some stock related activity. So when conformation was offered, at local fun matches, it was something new and different. Like most, I concentrated on showing in Conformation, to promote the breed. During the second part of the 70's ASCA sanctioned working trials began to pop up around the country. but it was still difficult to find sanctioned working trials. We drove to Tennessee and Michigan, and at 9 years of age he entered his first stock dog title and without having seen cattle in over 5 years, he earned his Started Trial Dog title on cattle. He could have easily finished, sheep and ducks but was never shown in these events. Cody earned the Triple Crown, an unofficial, yet recognized title, before the current titling programs, for being titled in all three areas of competitions. His real love was working cattle, a job at which he excelled. He was quiet and forceful, with excellent driving ability and balance. He was one of the few natural driving dogs I have seen in the breed. Cody was a beautiful, classy individual with a sensitive, protective temperament. He is the sire of champion, working and obedience titled progeny that went on to have a strong influence on early breeding programs in the Midwest, including Ch. Fairoaks Stormy Streaker CDX, OTDc, and Storms daughter, SVC, Ch. Casa Buena Kameo CDX, OTD and Ch. Wildwood Cody. During the early 70's many good dogs came my way and I continued to raise good puppies. As time passed, I began to define what constituted my ideal Aussie and helped along by the writings of Loyd C. Brackett, a plan was taking form. I began to pick and choose dogs that would be the foundation of a bloodline. In 1973 we made what was our most influential purchase. With the help of Ernest Hartnagle, a 7 week old dark red tri male NBT puppy was acquired from Joe Taylor in Moab, Utah. He was named Chulo Rojo of Fairoaks (pronounced Chewlo RoHo) which means red rascal in Spanish. What a phenomenal influence this pup would be. I raised and bought a lot of pups and dogs in those early days, always looking for those special qualities. Some stayed but many went but Chulo quickly became special. Special to us and unique within the breed. Chulo was a striking individual with the style, quality, and presence that turned heads. His type and physical soundness was outstanding. His working heritage showed in every step. His gorgeous deep red color drew attention from one and all. At a time in the country when red was not yet popularized, he was a red of national prominence. We considered his temperament perfect. He was eager, bright, tough and forgiving. Friendly, with keen intelligence and an uncanny sense of humor, he loved people but was protective and determined. He was a great individual and well ahead of his time. Chulo finished his ASCA championship quickly, winning some major specialties at that time. Although shown just a couple of times a year he continued to defeat the top winning dogs of his generation and for several generations after that. 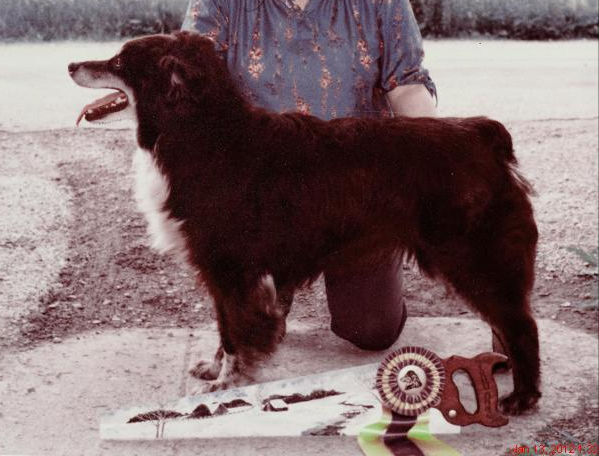 He had Best of Breed wins in 8 states and made the final cut at the ASCA National Specialty in 1979. Among his most impressive wins, the ones that we are most proud of were Best of Breed at the Great Lakes Specialty at 8 years and again at 9 years of age, over some top winning young champions of national fame. records and found that Chulo fulfilled the requirements. (with a minimum of 3 in each category) in conformation, working, & obedience. and dams, since they truely are the foundation pillers of the breed. many​​ champion, working titled dogs that have gone on to produce champion and working titled dogs, all with that distinct Chulo look. He was a superior individual, physically, mentally and genetically and is the solid foundation on which my breeding program stands. Cody died in 1984 at 14 1/2. 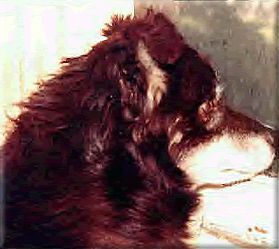 Chulo died in 1988 at 15 1/2. 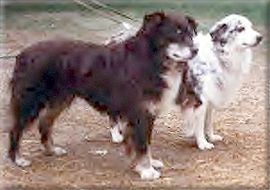 They both lived long and productive lives (Chulo had 4 month old naturally sired puppies when he died). They both left behind a legacy that is unique and becoming more so every year in the modem Aussie world. 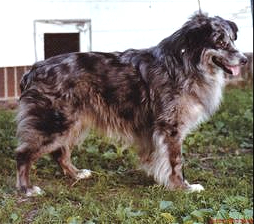 Because I continue to base my breeding program on the pieshysical, mental and genetic qualities that I have insisted upon, the distinct look and spirit of the old-fashioned Aussie will continue to be available with the Fairoaks dogs. This picture was taken at Greenfield, Ind. in 1974. 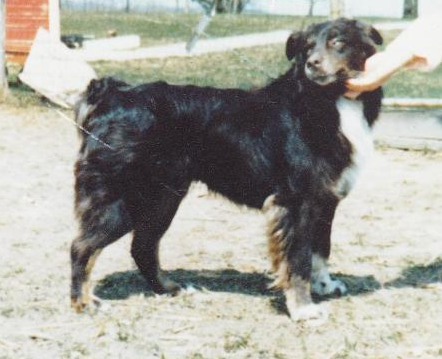 Cody was Best of Breed and also High Scoring Dog in Match with 199 from Nov. and also won Grad Nov, with 198 1/2, over 500 entries.